This casual style swivel gliding reclining rocking chair can add a great place to relax in your home. Use this chair to complete your living room or family room or use in a bedroom to create a great place to unwind after a long day. This chair has simple, track arms on either side a split seat back and padded chaise. This chair can swivel side to side, glide back and forth as well as recline so you can always be comfortable. With simple design and style, this gliding reclining chair is a great addition to your home. The Bradford Casual Swivel Gliding Reclining Chair by Klaussner at AHFA in the area. Product availability may vary. Contact us for the most current availability on this product. Base Description No visible base or skirt. 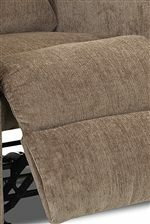 The Bradford collection brings you reclining furniture ideal for creating a comfy and casual environment in your home. Choose between regular and power recline and have a spot that is easy to use and allows you to sit back with just the press or pull of a button. Use a sofa to update a whole room while a loveseat or recliner chair can complete the look. Comfy and cozy, this collection bring you great reclining pieces for your home. 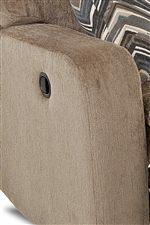 The Bradford collection is a great option if you are looking for Casual furniture in the area. Browse other items in the Bradford collection from AHFA in the area.